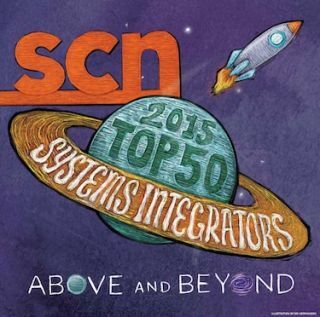 The list is out—and this year SCN’s Top 50 System Integrators bring with them a world of knowledge when it comes to the latest trends in the industry. Here, we spoke with some of the executives in our Top 50 listing about what they see in the industry day to day, and where they see our industry heading. What vertical markets and/or technologies exhibited the most growth for you in 2015? The corporate AV market continues to show robust growth for Anderson Audio Visual in 2015. The vast majority of our corporate clients now see AV as an integral step to creating an environment that is both appealing to their clients and their employees, as well as being an efficient and functional communication medium. AV is definitely not just reserved for the boardroom any more. We expect this robust growth to continue for at least the next three years. In 2015 IVCi experienced exponential growth deploying huddle room solutions for some of the largest companies in the world. Our approach has been to design and implement standard solutions with a focus on strategically sourcing equipment for our customers’ financial benefit. We are seeing strong growth in the unified communications space, as enterprises seek to tie together their many disparate communications systems (video, phone, presence, IM, email). With the end goal of increasing productivity, UC and collaboration go hand in hand. Secondly, we responded to the marketplace’s increased interest in self-service VMRs with the recent release of our Univago platform, hosted on Yorktel’s cloud with interoperability gateway services, virtual receptionist, and other features. Lastly, telehealth continues its growth as well, as we’ve seen a 28 percent jump in revenue in this area. Hospital systems are adopting telehealth carts, as well the back end support to design, deploy, and manage their systems, as well as “retail care” venues like major chain pharmacies. The enterprise market accounts for around 70 percent of our business, and this year is no different. The organizations within this vertical continue to look for better, faster ways of communicating, understanding, and retaining information. The trend and growth of technology within this vertical is the utilization of large, interactive, video wall environments operated by collaborative software and BYOD devices. We see this trend continuing as the demand for personal device use increases and immersive collaboration benefits become more understood. We continued to see an increase in the adoption of collaboration technologies, both wired and wireless, as well as videoconferencing-as-a-service (VCaaS). Financial services and technology verticals continue to add AV-enabled rooms in large quantity. Soft codecs and huddle room systems, as a percentage of the overall room count, also continue to increase. We saw the most growth in the local/state government markets and the energy sector. The largest vertical market for USIS AudioVisual Systems has been shared workspace. We have successfully designed and built scalable collaboration spaces with presentation and conferencing systems for a national provider of shared workspaces. In addition to audiovisual, we have also bundled our service offerings including security, structured cabling, and electrical services for this client. The greatest growth across all verticals we are experiencing is the integration of video wall solutions in our projects, as well as continued growth of unified collaboration solutions and interactive flat panel solutions. Our primary market is the K-20 educational sector which experienced a predictable growth for 2015.Jordan Myers, Account Manager, Interactive Solutions, Inc.
As we’ve seen over the last several years, healthcare continues to be a big growth market for us. We are involved heavily in telemedicine solutions and this year saw a tipping point in favorable regulations for telehealth as well as reimbursement policies from insurers. As these barriers continue to fall, we expect big things from our telehealth practice in 2016. What was the biggest business challenge of 2015, and how have you overcome it? Managing a growing organization through some fairly significant technological changes in the collaboration industry remains one of the more difficult business challenges. IVCi has been able to meet this challenge due to the exceptionally strong and deep bench of engineering talent. As we continue to grow, we are consistently challenged with finding talented and qualified personnel for all positions. In the past we would recruit when a position was needed with a more passive approach. In today’s market we have realized that recruitment must be a daily process, implemented and coordinated by a dedicated person. Along with this defined proactive approach, we have also learned that employment flexibility is vital. We have found that implementing options like telecommuting, flex time scheduling, and compressed work weeks have been deciding factors when getting the right team member. Keeping up with the growth of demand in the marketplace has been a challenge. Since Yorktel has an offering for enterprises at every stage of the video communications roadmap lifecycle, we find being able to scale at the same pace is a hurdle. We want to ensure that we are hiring and keeping quality talent and the demand outweighs the supply of human resources. Ever increasing product distribution channels continue to put pressure on product margins. An increased focus on service agreements and managed services is helping to replace that lost margin. Condensed project schedules. We have seen more large projects with aggressive schedules, impacting all trades on the job site than in any other year. Tritech remains nimble and operates as one team. We ask each department, from procurement through service to adapt and achieve the scheduled milestones. Working as one team is the only way we’ve been able to build large quantities of rooms in a short period of time. Our biggest challenge this year has been the influence and disruption from other trades attempting to participate in our markets. Our strong commitment to a complete turnkey AV solution enables us to show our clients the value of a true AV integrator. Like any fast growing audiovisual integrator, USIS AudioVisual Systems faces the challenge of staying adequately staffed. During 2015, we have had to focus more effort when augmenting our team; especially as our project workload increased. To remedy the problem we have hired for attitude and aptitude, rather than for skill. We have promoted from within our AV team, as well as by drawing from our vast pool of structured cabling, security, and electrical technicians and cross-trained them with audiovisual skill sets. One of our biggest challenges is managing schedules around construction delays. We are trying to be as proactive as possible, having involvement from the very beginning and throughout the duration of the project; i.e. being involved in design/construction meetings to ensure we’re in constant communication with the GC/architect and other trades regarding the design and construction process…the sooner we are involved, the better. Keeping a balance between on-board new customers and maintaining communications with existing ones (customer outreach). We created a series of customer outreach programs and hired a new position that focuses entirely on our existing customer base. Expanding our existing project tracking methodology to provide immediate labor consumption feedback when implementing classroom technology on a massive scale.Jordan Myers, Account Manager, Interactive Solutions, Inc. Going into 2015, no one expected to make huge leaps and bounds from a revenue or profitability standpoint. We went into this year planning on incremental but steady growth. It is difficult to motivate a team when you have to set expectations that aren’t your typical double digit growth numbers. However, we recommitted to our existing customer relationships while also increasing our new business development. We also worked on our corporate culture by renovating our physical office space, which has breathed new life into our team. Thankfully, we are on track to meet and exceed our goals for 2015. What kind of challenges and successes have you experienced with selling managed services? IVCi practically invented the video cloud manage experience back in 2001 and now has two cloud offerings: MVE and CVE. MVE provides complete management of an organization’s video environment including scheduling, proactive meeting monitoring, and concierge services. CVE is a video cloud service that spans traditional endpoints, software clients, and mobile devices. Customers have many choices when it comes to a cloud service and guiding them through the selection process is the main challenge. When customers choose an IVCi cloud solution, they tend to stay with us for years. In fact, our first two MVE customers still use the service almost 14 years later. An inherent challenge to selling managed services is that enterprises often outsource this aspect of their business to us either for financial reasons or because their current IT staff doesn’t have the skillset specific to videoconferencing, interoperability, BYOD/mobility, or the network complexities. Likewise, it’s typically the IT staff that is the customer interface with us, but they may be less familiar with what they need, the scope of their project, and related. However, this is not an end-all. Yorktel works as a partner to them to examine the best course of action. They will often engage our professional consulting team for a thorough, effective, scalable video roadmap. In 2015, Genesis Integration launched our own VCaaS platform in Canada called IndabaCall. Our cloud-based solution allows users to meet anytime, anywhere on almost any device. One of the challenges in bringing a product like IndabaCall to market is that it is a much different sales process than traditional AV integration. The challenge has always been adapting the offering to each client’s specific environment. For instance, we’ve had good success at adjusting our hiring criteria for onsite staff to match the client’s culture and technical needs, while maintaining margin. We’ve also been doing a good job at keeping instep with the client’s utilization of video and the use of Skype for Business, Zoom, etc. Due to a managed services focus, we have been able to see double-digit growth in our managed services from year to year. The USIS AudioVisual managed services offering consists of both on site and remote support and monitoring. During 2015, we have seen a much stronger demand for higher level on site resources; those above and beyond the typical room setup technician. These FEs (field engineers) are capable of providing our clients with real time diagnosis, and the ability to quickly repair problems since they are on site and familiar with systems they are supporting. When needed, these on site FEs can draw upon the expertise of our tiered remote support system to resolve any problems within our service level agreement. It has been the fastest growing part of our business. We have had great success in designing specific cloud-based offerings that are custom-tailored for the individual vertical markets we serve. The biggest challenges have been staying on top of the latest offerings, pricing the services competitively, and integrating within the customer’s existing workflow. Perfecting a clear and concise customer explanation on the difference between a manufacturer’s warranty and a preventative maintenance service level agreement.